"The Mori Clan should never be involved in a battle!". Hiroie was Kikkawa Motoharu's son and succeeded his elder brother Motonaga when the latter died in 1587. 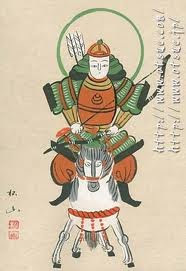 He ruled the former Amako domain (now Izumo) and was one of the most powerful men in the Môri clan, later leading troops under his cousin Môri Terumoto in the 1st and 2nd Korean Campaigns. When sides were being drawn between Ishida Mitsunari and Tokugawa Ieyasu, Hiroie urged Terumoto to side with the latter, a recommendation that Terumoto did not specifically decline (despite going along with Ishida), thus prompting Hiroie to send a secret message to Ieyasu to the effect that he could count on the Môri to do nothing in the coming fight. In the Battle of Sekigahara, Hiroie, with 3,000 men, occupied the lead position in the Môri army deployed on the east side of Mt. Nangû - when the fighting began he refused to move, thus preventing Môri Hidemoto (with 15,000 men) from entering the fray. After the battle, Hiroie was disappointed to discover that Ieyasu had no intention of rewarding the Môri for their inactivity, though he did increase Hiroie's own fief somewhat. Hiroie built Iwakuni castle in 1608.
. The Battle of Sekigahara 関ヶ原の戦い .
. Atago Gongen (愛宕権現) . 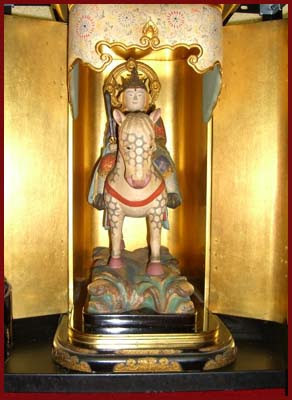 is a Japanese kami believed to be the local avatar (Gongen) of Buddhist bodhisattva Jizo Bosatsu. 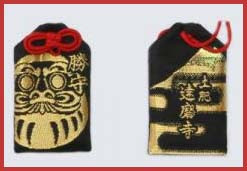 The cult originated in Shugendō practices on Mount Atago in Kyoto, and Atago Gongen is worshiped as a protector against fire.
. Shōgun Jizō 将軍地蔵　Shogun Jizo, General Jizo .
. Jizo Bosatsu　地蔵菩薩 .
. Tomioka Hachimangu　富岡八幡宮 .
. Daruma-Dera in Nishi-Izu 西伊豆の達磨寺 .
. Atariya 当たり矢 arrow to hit good luck . Atago Gongen 愛宕権現, a Kami considered to be a temporary incarnation of Jizō. This temple was founded in 1611 by 慶誉法印 / 慶誉上人 high priest Keiyo. He was priest at the temple 小田原蓮華寺 Renge-Ji in Odawara, a clan temple of the 北条氏 Hojo, and Tokugawa Ieyase invited him to come to Edo. He received the temple land at 矢之倉 Yanokura to built a temple to house a statue of Shogun Jizo, which he moved from Oawara. The temple burned down many times and the statue of Jizo was lost.